Stop by Land of Sleep this Friday, February 16th through Monday, February 19th for our Presidents' Day Mattress Sale! Receive 15% off the sale of any mattress, and as always at Land of Sleep, receive free mattress delivery, free removal of your old bed, and free set up of your new bed. If you're in need of a new mattress, our year-end sale is the best time to buy. Stop in today through January 1st to get the best deals on brand name mattresses including: Serta, iseries, icomfort, Beautyrest, Knickerbocker, Dunlopillo and more! What Makes Dunlopillo so Great? Getting a good night’s sleep requires more than going to bed at a decent hour. If you often find yourself tossing and turning or waking with back or neck pain, you’re likely sleeping on the wrong mattress. The tricky part is knowing exactly what you need as you head into a mattress store faced with plush memory foam beds promising you that you won’t be left counting sheep. 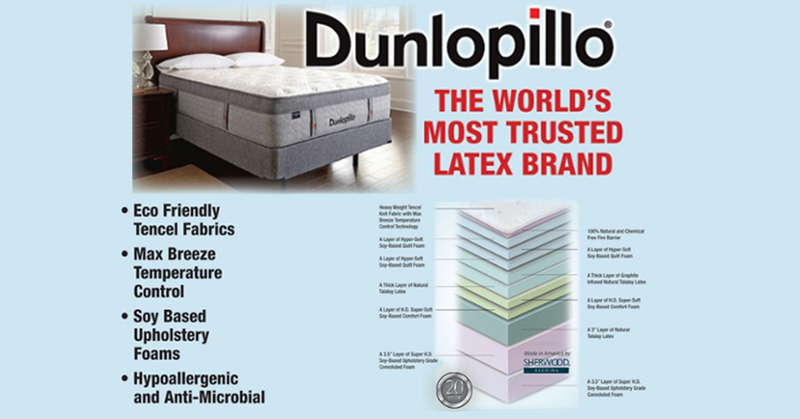 When it comes to quality and value, consider Dunlopillo—a company that has been in business for the better part of a century. Come to Land of Sleep for our Black Friday Sale! From Friday, November 24th through Monday, November 27th, you will recieve 15% off any mattress set. Get free same-day delivery and set up of your new mattress and free removal of your old one. Come to Land of Sleep in the next couple of weeks for our Fall Mattress Sale! From Friday, November 3rd to Friday, November 17th, we are offering 15% off any mattress set. Get free same-day delivery and set up of your new mattress and free removal of your old one. Stop by Land of Sleep this weekend for our Labor Day Mattress Sale! Get free same day delivery and set up of your new mattress and free removal of your old one. This Labor Day, we are offering 15% off any mattress from Friday, September 1st to Monday September 4th, 2017. 4th of July Mattress Sale! Stop by Land of Sleep this weekend for our 4th of July Mattress Sale! Receive 15% off the sale of any mattress, and as always at Land of Sleep, receive free delivery, free removal of your old bed, and free set up of your new bed. Be sure to stop by Land of Sleep starting this Friday, May 26th, 2017 through Monday, May 29th, Memorial Day, for our Memorial Day Mattress Sale! Receive 15% off the sale of any mattress, and as always at Land of Sleep, receive free delivery, free removal of your old bed, and free set up of your new bed. March Madness is in full swing! Stop by Land of Sleep anytime in the month of March for our March Madness Mattress Sale! Receive 15% off the sale of any mattress, and as always at Land of Sleep, receive free mattress delivery, free removal of your old bed, and free set up of your new bed. Stop by Land of Sleep this Friday, January 20th through Monday, January 23rd for our Anniversary Mattress Sale! Receive 15% off the sale of any mattress, and as always at Land of Sleep, receive free mattress delivery, free removal of your old bed, and free set up of your new bed.